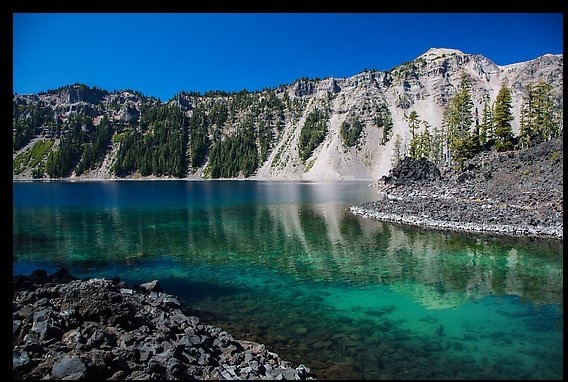 Welcome to the Crater Lake National Park Information Page. The closest major airport is Eugene Airport which is 120 miles Northwest of the park. There is an airport at Klamath Falls, OR which is 60 miles South of the park. There is an airport at Medford, OR which is 80 miles Southwest of the park. 1. Take I-5 South to Eugene, OR take Stateroad 58 East to Highway 97 to Stateroad 138 to the park. 2. Take I-5 South to Roseburg, OR take Stateroad 138 East to the park’s north entrance. 3. From Roseburg, OR – Stateroad 138 East to the park’s north entrance. 4. From Bend, OR – Highway 97 South to Stateroad 138 west to the park’s north entrance. 1. Take I-5 North to take Stateroad 62 North to the park’s west entrance or to Stateroad 230 North to Stateroad 138 to the north entrance. 2. From Klamath Falls, OR – Highway 97 North to Stateroad 62 North to the park’s south entrance. Head for I-5 North or South and follow the North and South directions to the park. Head for I-5 North or South or Highway 97 North or South and follow the directions for North or South to the park. President Theodore Roosevelt signed the bill on 22 May 1902 for Crater Lake National Park to become nation’s fifth oldest park. About a half million people visit the park each year, with Jul and Aug being the busiest months. The Klamaths revered the lake and the surrounding area, keeping it undiscovered by white explorers until 1853. That year, on June 12, three gold prospectors, John Wesley Hillman, Henry Klippel, and Isaac Skeeters, came upon a long, sloping mountain. Upon reaching its highest point, a huge, awe-inspiring lake was visible. “This is the bluest lake we’ve ever seen,” they reported, and named it Deep Blue Lake. But gold was more on the minds of settlers at the time and the discovery was soon forgotten. Captain Clarence Dutton was the next man to make a discovery at Crater Lake. Dutton commanded a U.S. Geological Survey party which carried the Cleetwood, a half-ton survey boat, up the steep slopes of the mountain then lowered it to the lake. From the stern of the Cleetwood, a piece of pipe on the end of a spool of piano wire sounded the depth of the lake at 168 differnt points. Dutton’s soundings of 1,996 feet were amazingly close to the sonar readings made in 1959 that established the lake’s deepest point at 1,932 feet. Campsites are available at the Mazama Campground. The visitors centers and Crater Lake Lodge are accessible. When the 33-mile Rim Drive is open during the summer, there are more than 20 Crater Lake overlooks which are accessible. All backcountry trails should be regarded as strenuous. Appropriate planning, including practice of Leave No Trace techniques, should be considered for all backcountry expeditions. Backcountry permits are required for overnight snow camping. Free permits are required for anyone wishing to camp overnight in the backcountry. Permits are available at both park visitor centers. Each year, increasing numbers of cyclists come to Crater Lake National Park to ride around the lake on the 33-mile Rim Drive. The route is physically demanding. Steep hills at high elevation may encourage even the most fit riders to pause at many of the road’s thirty overlooks and pullouts. The payoff, however, is spectacular scenery, seen at a pace that few visitors choose to take enough time for. Crater Lake National Park offers ranger-led programs for bus tours on a staff-available basis. There are two campgrounds inside Crater Lake National Park. Fishing is allowed from May 20 through Oct 31; however, the lake can be fished year round except when seasonal limitations prevent safe access. The Mazama Village complex operates a camper store from June through September, with laundry, showers, and gasoline available as well. There is no gasoline available from November through late May. In Crater Lake National park, there are over 90 miles of one-way and loop trails, including 33 miles of the Pacific Crest Trail as well as hikes up Mount Scott, Garfield Peak, and Crater Peak. It is also possible to hike to the lake surface on the Cleetwood Trail. Lodging in Crater Lake National Park is limited to two facilities and two campgrounds. The two lodging facilities are Crater Lake Lodge and Mazama Village Motor Inn. Permits are required for all backcountry camping in the park and are issued free of charge at visitor centers. Reservations are not taken for camper/tent sites, however, they are strongly urged for rooms at the Crater Lake Lodge and the Motor Inn. Reservations may be made for organized group interpretive tours in the summer and on the weekends in the winter season by calling visitor information. Educational groups can make reservations for weekdays during the school season. Pets are allowed in the park but are strictly regulated. Pets are allowed in the campgrounds. Pets must be on a leash at all time while in the park. Pets cannot be left unattended, and pets are not permitted on trails. This visitor center is located at park headquarters on the south side of the park and is open year round. A park ranger or volunteer is on duty to assist with park information, trip planning, weather forecasts, and backcountry camping permits. Informational materials, including the seasonal newspaper Crater Lake “Reflections”, can be mailed to prospective visitors upon request. An 18 minute video, The Crater Lake Story, is shown every half hour in the summer, and upon request in the winter. Books, maps, posters, and educational materials are available for purchase from the Crater Lake Natural History Association, a non-profit group which supports interpretation, scientific research, and development of park publications. Public restrooms and a post office are located in this building as well. Monday through Saturday – 9:00 am – 12:00 pm and 1:00 pm – 3:00 pm, except holidays. The months of July through mid-September are generally mild with little precipitation. Due to the elevation of the park (6,500 ft. at Park Headquarters and 7,100 ft. at Rim Village), weather conditions may change quickly and a warm jacket and wool sweater are always recommended items to carry. From October through June, weather conditions dictate preparing for extreme winter conditions. Blizzards, high winds, extreme cold, and low visibility dominate the weather patterns, Visitors should come with cold weather gear.